SAN FRANCISCO – Friday night the San Francisco Giants and Colorado Rockies played an eighteen-inning game in which the Giants barely squeaked out a win in the wee hours of Saturday morning. Saturday’s contest was back to the regularly scheduled program. The Giants sent Madison Bumgarner to the mound to face off against Kyle Freeland and the missing Rockies offense. Bumgarner’s last start was a tale of two halves, cruising through three before blowing a five-run lead. Because Saturday’s game was played only twelve hours after last nights contest, both the Rockies and Giants needed a few innings to wake up. Offense and clean base running have been hard to come by in this series, and that would be no different in game three of the series. After a quiet first inning, Bumgarner would surrender a base hit to Trevor Story in the top of the second. Later on in the inning, with one out, Ian Desmond would ground into a beautifully turned double play by Pablo Sandoval. Friday night it took the Giants an additional twelve innings to score the go-ahead run. Saturday the Giants offense scored as many runs in the third inning as they did in seventeen innings Friday night. After an 0-6 night at the plate on Friday, Gerardo Parra would lead off the inning with a base hit. Steven Duggar followed with a base hit of his own before Yangervis Solarte laid down a sacrifice bunt to move both runners into scoring position. The newfound heartbeat of the Giants offense, Kevin Pillar, knocked in the first run of the game with a sacrifice fly to left center. Buster Posey followed up with a run-scoring double down the right field line and the Giants took an early 2-0 lead. Bumgarner carved up the Rockies offense early and often. Surrendering just two hits over five innings while striking out five, he took advantage of an ice-cold Colorado lineup. Not happy with his three home runs and 12 RBI’s this past week, Pillar decided that one more couldn’t hurt. Crushing his fourth home run of the year and knocking in his 13th RBI, Pillar and the Giants would extend their lead to 3-0. Rockies hitters finally got to Bumgarner in the top of the sixth. Chris Iannetta led off the inning with a base hit and would eventually come around to score on a double to left field by Garrett Hampson, cutting the Giants lead to 3-1. Nolan Arenado struck out to end the top of the sixth inning on a pitch that he clearly thought was out of the strike zone. 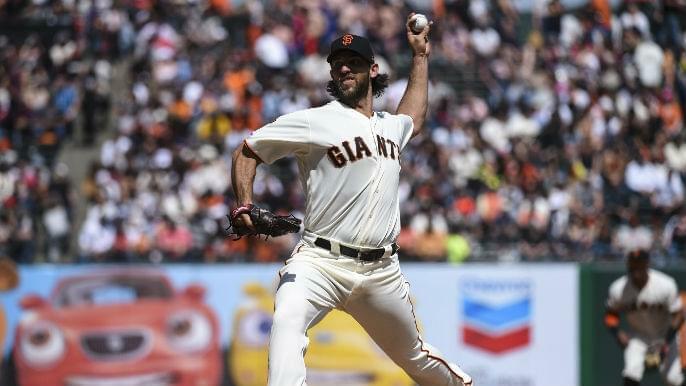 Just like his previous start against San Diego, Bumgarner would continue to let the opposing team back in the game by giving up the long ball. In the top of the seventh inning, Bumgarner would surrender a solo homer to Mark Reynolds, cutting the Giants lead to 3-2. Bruce Bochy removed Bumgarner in the top of the eighth inning after giving up a leadoff double to Iannetta. With nobody out, Reyes Moronta would enter with Bumgarner’s inherited runner on second. Striking out the side with ease, Moronta would preserve the Giants 3-2 lead. In the bottom of the eighth inning, the Giants bats continued to scratch and claw. Sandoval led off the inning reaching first on a drop-third strike that got away from Iannetta. The Giants loaded the bases with a single from Joe Panik and a walk from Belt. Following two separate sacrifice fly’s from both Parra and Steven Duggar, the Giants would tack on two more and extend their lead to 5-2. On Saturday, Bochy gave the ninth inning to Sam Dyson instead of Will Smith. The recent trend of clean and stress-free ninth innings would continue, as Dyson set the Rockies down in order to close out the game. The Giants extend their winning streak to three games on Saturday behind their ace and some timely hitting. Bumgarner earned his first win of the season and improves to 1-2 with a 3.12 ERA over 26 innings pitched this year. Kyle Freeland (1-3) picked up the loss for the Rockies. Sunday, the Giants send Derek Holland to the mound as they try to sweep the last-place Rockies in the four game series. Holland will square off against Colorado right-hander German Marquez.